Streamline corporate card statement reconciliation, increase visibility and reduce the burden of manual processes for cardholders and administrators. 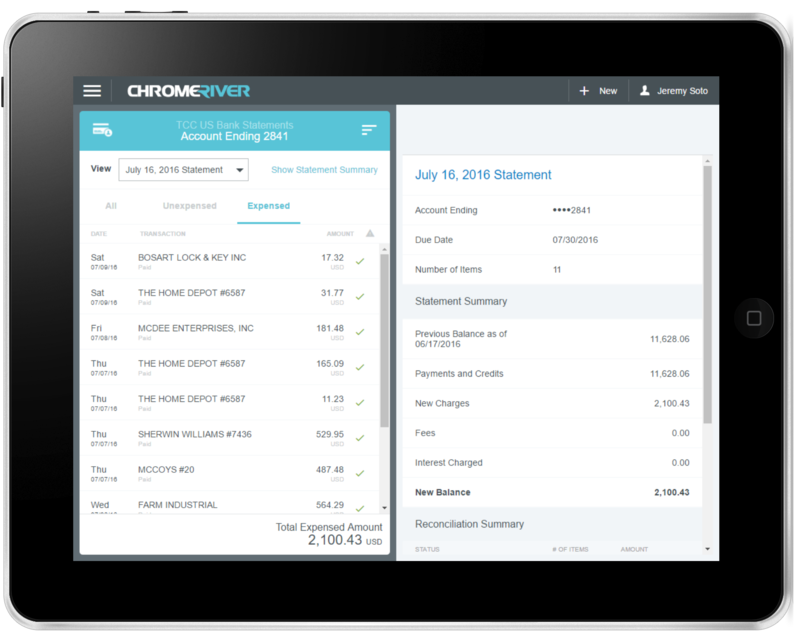 Chrome River STATEMENTS is a solution jointly created by Chrome River and U.S. Bank to help organizations better manage their card program reconciliation. Corporate card programs can be a helpful tool in helping organizations control travel and expense spend. However, traditional card programs often lack deep integration into expense management programs, and therefore don’t offer the transparency that card administrators require to ensure prompt allocations, submissions and payments. For the cardholders, there can be a lack of visibility of how card transactions tie to bank statements in their expense program, which can delay expense submission by introducing another manual step. For administrators, reconciliation between the card statement and expense report is a manual process, again, slowing down the approval and payment process. A lack of visibility of what has and has not been accounted for can also introduce further delays and inaccuracies into the process. Chrome River STATEMENTS delivers wide-ranging benefits across the organization, allowing them to bypass these challenges. Streamlines card reconciliation with expenses. Improves administrator visibility across cardholders. Direct integration of U.S. Bank card statements into Chrome River EXPENSE. Combines with Chrome River DIRECT PAY for card payments. Track expenses and then reconcile corporate card statements. Increase visibility into card spend and minimize the potential for fraud or misuse.